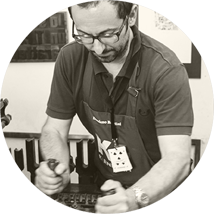 Damiano Bandini loves letterpress, and movable types. This is why he still runs an old letterpress workshop in downtown Faenza, carrying on passion and knowledge handed down from father to son. La Vecchia Stamperia is a historic workshop (Bottega Storica dell’Emilia Romagna): everything started in 1920, so this workshop has been printing movable types on paper for more than 90 years – and counting. He has got one of the largest collection in use, of very rare metal block-prints and unique artistic wood ones. 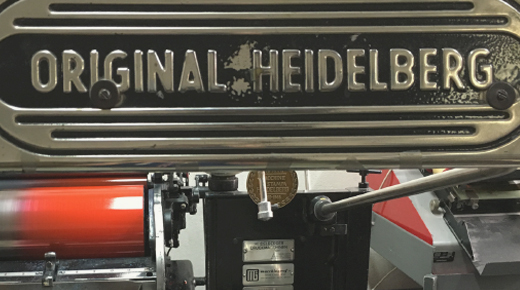 Did you buy a Heidelberg Windmill — or “Stella”, as we lovely call it in Italy — and all you need is love… sorry, experience to become a professional letterpress printer? Join us in Faenza and Damiano Bandini will share a lot of secrets with you! Will you mainly print texts composed with a lead type or will you also use a lot of images? And what about cliché and xylography? You have to prepare your Stella in different ways, starting with the right packing. Set the preparation the wrong way, and you’ll have more than some troubles. You also have to know how to ink up the press — and before that, how to prepare your colors! — How to position and lock the form and how to eliminate spring, how to a lot of things, you're right. And what about make-ready? Damiano to the rescue! And after this workshop, letterpress printing won’t have secrets for you anymore. And passion is what you’ll find in this workshop too, where La Vecchia Stamperia with the Kerning Staff will join their forces to guide you through a waterfall of characters. We reserved a few special discounted tickets (79€) for students. If you are eligible, just send us an email with your ID and a proof you are really a student and we will send you a dedicated link to complete your purchase.